Deciduous forests consist of trees that do not bear cones. They contain seeds that dropped on the nearby forest floor. These trees tend to lose their leaves once each year when the weather turns cold. 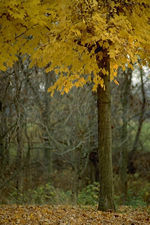 Since they lose their leaves, sunlight can reach the ground and plants can grow underneath them. Grasses and flowering plants grow in these forests. Deciduous forests are home to many animals. The weather tends to be moderate. The summers are warm, and the winters are cool. Some deciduous forests experience winter snowfall. Rainfall tends to be heavy.